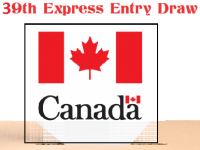 IRCC invites 755 candidates to apply for Canadian permanent residence after the latest draw of the 39th Express Entry pool held on 27th July 2016. The minimum number of CRS required for the candidate to receive the ‘Invitation to Apply’ (ITA) was 488. The candidates who have received their ITA’s are now in a position where they can submit an application for Canadian PR. The Principal candidate will can also be accompanied by family members (Spouse, common law-partners, and dependent children) while coming to Canada. The CRS cut-off has been in the line with the previous draws, which took place over recent weeks and months. The latest reports show that upon analyzing various Provincial Nominee Programs, PNP’s has been quite successful in attracting the Express Entry candidates so far during this season. Gap between the CRS points required in the current draw and previous draw has narrowed, while comparing to the draws happened in January 2016. During those draws there was a vast difference in the CRS and invitations given. Required CRS was 461 and invitations issued were 1,463. The difference between the older draws and the recent ones is quite evident.